Plants vs Zombies is pure tower defense joy – what could be more entertaining than killing zombies with the power of your perfectly planned garden? If you haven’t played the full game, you can now grab it for the low low price of… Free! 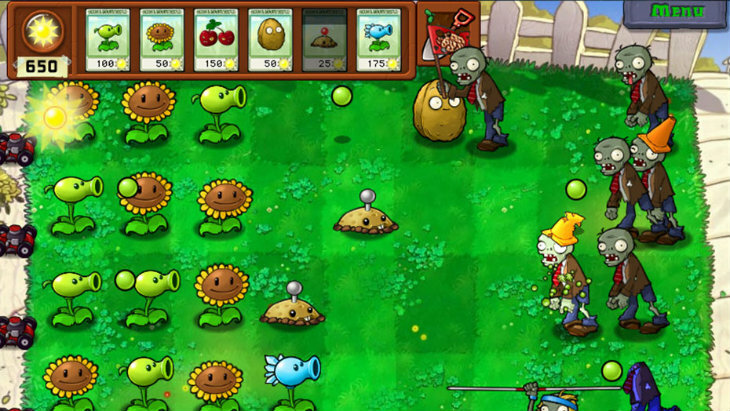 Get ready to soil your plants in an all-new action-strategy game from PopCap! A mob of fun-loving zombies is about to invade your home, and your only defense is an arsenal of 49 zombie-zapping plants. Use peashooters, wall-nuts, cherry bombs and more to slow down, confuse, weaken and mulchify 26 types of zombies before they can reach your front door. Each zombie has its own special skills, so you’ll need to think fast and plant faster to combat them all. But be careful how you use your limited supply of greens and seeds: as you battle the fun-dead, obstacles like a setting sun, creeping fog and a swimming pool add to the challenge. And with five game modes to dig into, the fun never dies! I’m such a tower defense fan, it’s actually quite sad. I just can’t get enough of them – I used to play all the flash ones on Kongregate back in the day. Now, I limit myself to one on my iPad at any given time. Are you a fan of the genre, or is this all just a bunch of filthy casual stuff to you? Next article What’s the difference between 30fps and 60fps?